Woodfordes Great Eastern is a pale golden beer with a teasing blend of lager malt flavours and hop aromas. Well balanced with a long malt finish taking over from the fading hop notes. Great Eastern is an ideal refreshing beer for summer and also a great introduction for Real Ale Virgins. A highly acclaimed as the benchmark for the new breed of straw-coloured 'global' beers. 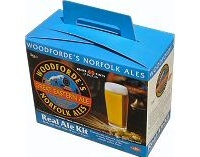 It was first brewed in 1994 to commemorate 150 years of the Great Eastern Railway in Norfolk.